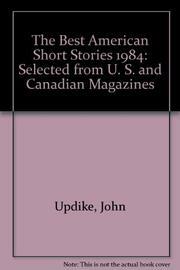 It's not surprising, perhaps, that Updike--a dazzling critic as well as an assured, gifted story-writer--proves to be the most satisfying guest-editor of the "Best American Short Stories" series so far. True, as with other celebrity-anthologizers (Joyce Carol Oates, John Gardner, etc. ), one can see an idiosyncratic sensibility at work in some of the choices here. But, in Updike's case, personal taste never leads to the inclusion of second-rate, graceless work. Jeanne Schinto's "Caddies' Day" is a fine reflection of Updike's interest in the country-club world; his passion for everyday technical detail can be seen in Stephen Kirk's "Morrison's Reactions" (dentistry) and Lawry Pei's "The Cold Room" (animal-research labs); and an Updike-ian sense of subtle family-situation comes through in mother-oriented stories by Paul Bowles and Rick DeMarinis--while Donald Justice's "The Artificial Moonlight" echoes Updike's nostalgia with its feel for bygone sociability. Even more impressive, however, are the many standout stories here which have no particular link to Updike's particular world or style: Dianne Benedict's grotesque, moving study of a sick couple's impossible leave-taking; Mary Hood's wonderfully voiced account of a depressed southern matron's last days; good-ol'-boys comedy from Madison Smartt Bell, the dense eloquence of Lee K. Abbott (like boiled-down Walker Percy), a Botswana story from Norma Rush--plus first-class work by James Salter (the knowing, sneakily graceful "Foreign Shores"), Andre Dubus (the passionately Catholic "A Father's Story"), and Mavis Gallant (the distinguished, faultless "Lena"). And, like this year's O. Henry story-collection, Updike's shrewd, professional gathering is topped by a classic that's sure to appear in anthologies for decades to come: Cynthia Ozick's scouring projection of the path of Jewish history toward Miami Beach--"Rosa.